after your death and will be legally binding? With our very clear guidelines below it need not be a daunting task either. It's never too soon! Ensuring your loved ones are taken care of as only you can best determine how, should be high on anybody's list of priorities. Unfortunately a large number of people die without a will (intestate), leaving it up to the courts to make decisions on their behalf. Many people do not need a lawyer to draft a basic will. If your circumstances are such that you will not leave a very large estate behind, and the beneficiaries are fairly straightforward, it is a simple matter to show you how to write a will in 9 steps. The infographic here gives you a bird's eye view of the 9 steps which we explain in detail. We'll get to that in a minute. 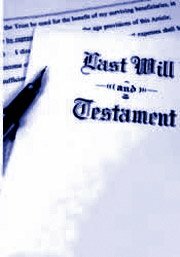 We also supply a variety of free last will and testament forms (links supplied a bit lower down on this page) that can be used as sample documents to compile your will. Incidentally, you should also make a new will when any of your circumstances change, such as the birth of a child, divorce, change of property, moving to a new address etc. A holographic will (handwritten will) needs to conform to certain requirements too and is not legal in every territory. In the past codicils were added to wills to reflect changes - rather than retyping sometimes lengthy documents. These codicils also had to be witnessed and/or notarized and could be confusing. It is much easier nowadays to amend the will electronically and produce a new complete document. Note: In giving your personal details, be as complete as possible - add any identification numbers, maiden names etc. People typically name the remaining spouse or main beneficiary of the estate as executor. This makes good sense, since they have knowledge of the assets and the interest to see to a speedy wrap-up of the estate and the probate process. A competent friend may also be nominated, but you should discuss their willingness to do this duty with them first. You should also name an alternate executor should your first choice not be available or willing at the time. If you do not specifically name an executor in your will, the courts will appoint one and executor's fees may be payable. Executor of a Will as well as information on the Probate process. If you will be drafting a Testamentary Trust Will, you will need to nominate a trustee - if it is not the same person as the executor. There's quite a bit of information you need to explore on this which we also cover in detail, starting with the page on Family Wills and Trusts. If your children are of the age that they require guardianship and there is no remaining natural parent to take care of them, you should name a legal guardian in your will or the court will appoint one. This is probably the most important clause for parents in determining how to write a will. Have a serious discussion with your choice of guardian to confirm that he / she is prepared to take on this duty, before naming him / her in your will. If your choice is a stable married couple, state both their names. Unlike temporary guardianship a legal guardian may be responsible for your children for a long time and must be chosen with care. Guidelines for choosing a guardian, can assist you in naming a legal guardian in your will. Name your spouse or life partner, children and other beneficiaries specifically and without leaving any doubt as to their identity. Name alternate beneficiaries in case of simultaneous death. In most cases a spouse has a right to inherit. Should you disinherit your spouse and it is contested in court, your will may be overruled. You need to consult with an attorney to get information and advice if you do not want your spouse to inherit. An important part of how to write a will, is to distinguish between estate assets that are already assigned to beneficiaries in the event of your death and those that are not. If you have assets in a different country, you should make a separate will specifically for that country and exclude those assets from the will made in your home country. Every country has different inheritance laws and taxes and lumping all assets together can create serious problems and delays. You should investigate how to write a will for foreign assets. Under the heading "BEQUESTS" you could name persons or organizations whom you wish to inherit specific property or cash sums. You can express your wishes on whether to be cremated, buried or have your remains disposed of in any other way, as long as your wishes do not contravene any laws in your state or country. Your last will and testament is not the document to specify how you wish to receive treatment in a medical crisis. Please refer to our Living Will page for more information. You have to sign your will in the joint presence of witnesses, since they will in fact be witnessing (see) that you are indeed the signatory of the will and under no duress to do so. Inform them of the fact that it is your Last Will and Testament that you are signing. They do not need to know the content. The actual date and place of the signing must be recorded in writing. It is highly recommended that everyone sign (or at the very least initial) every page of the will. This serves as evidence that no additional pages were inserted at a later date. A minimum of two witnesses in most states and countries (3 in Vermont) are required to witness the signing of your will. Their full names, addresses and signatures should be on the document. The witnesses have to sign in the presence of the person making the will. You must add a declaration that they witnessed your signature, that they are legal adults and of sound mind and that they consider you of sound mind, adult age and under no duress or undue influence to sign your will. The date and place of their signing (same as yours) must be recorded. Note: It may not be a requirement in your jurisdiction for the witnesses to sign in one another's presence. Practically though, it does not take long for the will maker and witnesses to complete their signatures whilst all being present at the same time. Our last will and testament templates have the witness attestation worded as such. If your witnesses will not be signing in one another's presence, you will need to amend their declaration accordingly. Important Note: The witnesses must not be beneficiaries of your will in any way whatsoever. I recently had a fully probated U.S. will dismissed in Puerto Rico because the Witness declaration lacked the time-of-day, a local requirement. The time zone must also be stated if not GMT. My advice to anyone trying to leave property in Puerto Rico by will is to find a member of the Puerto Rico bar to draw up the will, (because of the particular administrative requirements in Puerto Rico) and not to rely on U.S. rules or lawyers. An important part of how to write a will or any legal document is to number the paragraphs in order. This is a simple way to confirm that the document is complete with no missing pages or additional pages inserted. 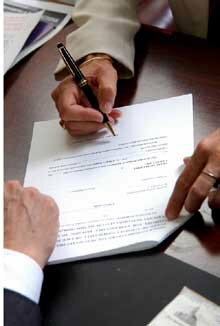 A final optional part - compulsory in Louisiana, and always advisable - of how to write a will is to have your will notarized. The signing process will be done in the presence of a notary public or commissioner of oath and the identity of the testator must be proven (photo identification must be provided). The notary public will add a statement that the will was properly executed i.e. that the correct procedure was following during the signing process. If so duly notarized, the will becomes Self Proving during probate. This means that the court need not call on the witnesses to testify. The easiest is to just reference your Social Media Will as an addendum to or in your Last Will and Testament document. The details of all your online accounts need not be made public - in fact, that's the last thing you would want to do. We are making it even easier for your with our NEW APP Release! With the app you will be able to securely add your online account details (e.g. Facebook, Instagram, eMails etc.) with instructions to your executor on how you want those acounts finalised when you pass away. Go to our EndExec page to register your email address and get advance notice of this App release. 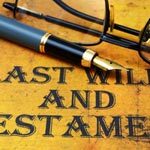 The information on this site can show you how to write a will and provides a free will form, but if you wish to make a complex will or need help with estate planning and asset protection, you must seek professional guidance.